Danny Trejo is short. No, seriously. Earlier in the month, he was a guest at the Mad Monster Party convention here in Phoenix, and we were surprised to discover how… “fun-sized,” shall we say, he is. I was expecting someone in line with his on-screen personas – so, roughly eight foot tall, breathing fire and possibly shooting laser-beams out of his eyes. Not the case. He’s shorter than me, and I come from a long line of short Scottish people (it helps keep out the cold up there). Nice guy though. Very approachable, at least, according to Chris – personally, I still didn’t approach him, since I have a mental barrier about that kind of thing. But that’s for another review; when we came home from the con, I instead opted to honor Danny by surfing Netflix and watching one of his films. It’s the kind of thing which is right in Trejo’s wheel-house: he plays Vietnam vet Frank Vega, who finds difficulty settling back into civilian life, can’t get a job and ends up running a hot-dog stand for decades. 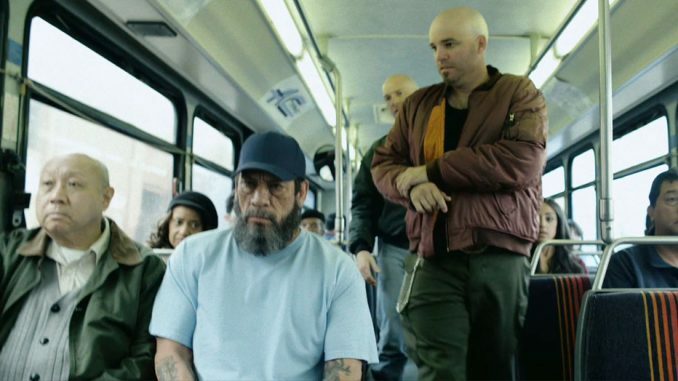 One day, riding the bus, he stops a pair of skinheads who are causing trouble (top), and a video of the incident goes viral, giving Frank 15 minutes of fame. After things have largely returned to normal, a friend gives him a flash drive, just before being killed in the street. With the police apparently apathetic, it’s up to Frank to catch the killers, stop city corruption and protect his next-door neighbor, Amber (Drake), and her young son (Duffy) from domestic abuse. Y’know, the usual vigilante stuff. I kinda wonder if this was shot during down-time from Season 5 of Sons of Anarchy, which would have been shooting round about the same time. Because, not only does this star Trejo, who was playing Romeo Parada in the show, it also has two other major actors from it, albeit in minor roles. Ron Perlman plays the LA mayor, who naturally, is involved neck-deep in the corruption, and Winter Ave Zoli, Lyla in the series, turns up as a masseuse. [Sidenote: who names their daughter “Winter Ave”?] Given director Craig Moss is perhaps best known for spoofs with titles such as The 41-Year-Old Virgin Who Knocked Up Sarah Marshall and Felt Superbad About It, I’m somewhat surprised he didn’t include a motorcycle gang called the Brothers of Chaos. Though I’m still not sure whether this is intended to be a parody or not, because you don’t typically get “real” films inspired by viral videos. It’s a fairly thin premise, and the script doesn’t do anything much with it beyond the glaringly obvious, but Trejo is one of those guys we will watch in just about anything (even having been burned by some of his employment choices). There’s certainly no shortage of him in this, and he’s appropriately gruff and ruthless – or rough and toothless, hohoho. Y’see, that’s funny, because Danny was 68 when he made it. I love the fact that he’s embracing his age here, not trying too hard to be something he isn’t, like certain action stars I could mention. That said, could have done without the unresolved sexual tension between him and Amber, who is a good 30 years younger. That should be a fatherly relationship only, please. I was reminded frequently of Hobo With a Shotgun, though that went far further down the path of exploitation, and was much more entertaining as a result, likely with fewer resources – this appears to spend most of its money on a lengthy double-bus chase at the end. The whole “viral superstar” angle is almost irrelevant by that point, and feels more like a gimmick than a meaningful part of the story. However, I did love some aspects, like the way Frank takes the bus everywhere on his mission of vengeance, and the film works best when it adopts this kind of approach, tacitly acknowledging its own silliness. I get the sense this probably wouldn’t have worked at all with anyone else bar Trejo in the lead; fortunately, he’s present and correct, and if the results aren’t great, it’s a good deal better than Machete 2, that’s for sure.